California native plants can be used in every garden style: formal, Japanese, architectural, you name it. But even when the garden is “wild and natural,” gardeners usually want to know about pruning their trees, shrubs, vines, perennials and grasses. I’ll be writing about when, why, and how to prune various California plants in the garden. In particular, I’ll be writing about trees and woody shrubs. If you take your time, you’ll learn how each species responds to pruning. When you think about pruning any plant, ask yourself what do you want to change, and what do you want to achieve? Are there branches that are dead or rubbing against each other? Do you want the plant to stand out as a focal point in the garden? Has it become too leggy? Do you want to control its size? As you think about why you want to prune, don’t expect to achieve everything at once. Plants are the controlling partners when it comes to their form, size, and growth. If you take your time, you’ll learn how each species responds to pruning. Make pruning plans that are two, three, and five years in the making. Madrone (Arbutus menziesii) Photo: Doreen L. Smith. Pruning weakens a woody plant, because it takes away part of the plant’s food source (leaves); it also creates a wound that the plant needs to heal. To minimize these two aspects, prune when the tree (or any woody plant) is dormant — AND when it is just about to start pushing out new growth. That’s because, with that new growth, healing tissue starts to form, beginning the process of covering the wound with healthy tissue. (Of course, removing dead wood doesn’t weaken the plant at all, and can be done at any time.) And, pruning just before a plant leafs out results in a more beautiful plant. New growth hides any awkwardness that pruning cuts might make. 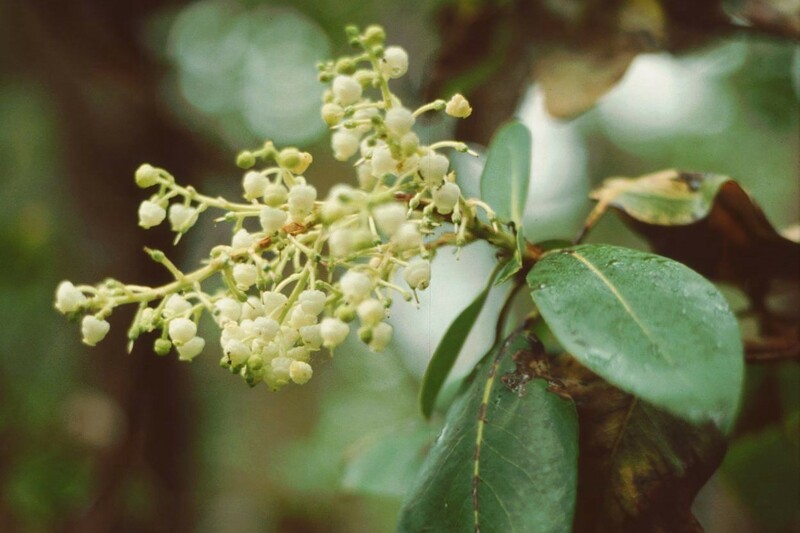 One way to anticipate the onset of new growth is to observe a plant’s flowering. Notice that, as the tree’s flowers fade, new foliage begins to emerge. Because so many of our California woody plants are dormant in summer and do their growing when the rain kicks in, the deep of winter is usually the wrong time for pruning. Exceptions to that rule include pines and arbutus. For these species, plan on making any needed structural cuts in December or January. Annual, finer pruning work on pines can be scheduled for October or November. I am not sure if you still check in on this post, but thank you for writing it–it has been very helpful. I would like to prune a native shrub to be ball-like. I have a meadow garden and would like to include some small, structured visual elements. My first choice is Ceanothus thyrsiflorus Skylark. Do you think this is a good choice for shaping and pruning starting with a 1-gal size? Are there particular CA native shrubs that respond well to long-term pruning and shaping? Thank You! starting with a one-gallon plant is ideal in my mind, for establishing a happy plant. Keeping any shrub ball-like is mostly pretty simple: find your inner deer and regularly nibble at the tips to keep everything short and compact. With a flowering shrub, you’ll want to do most of your nibbling in the months following the bloom so you don’t cut off the flowerbud. You will also need to address the inner structure, over time, to make sure it supports the size and shape you desire, of course. Ceanothus thysiflorus will keep to your desired structure pretty well — it will be a bit loose and a bit bulbous rather than round, I think. Address the structure by getting as close to the ground as you can and look up and into the shrub, and develop main scaffolding over time. Remember that the top will want to keep getting larger, so be most aggressive in your tipping and pruning there. Aspire to keep the top third narrower than the “waist” of the plant. Working with California natives is always an experiment, given varying soil, sun, etc., condition, Plants that respond best to pruning tend to be ones that are relatively long lived, and that get twiggy in response to pruning. You can observe some real success stories by exploring which Cal. natives have been adopted by bonsai enthusiasts! I would love to see how your garden and your pruning develops! Please share pictures with us!